Fight Back! Website Redesign | Fight Back! Fight Back! News is proud to announce the launch of our new web site! 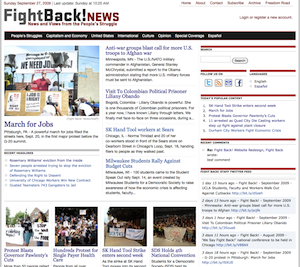 As Fight Back!’s network of activists and writers expands, we publish more and more articles. Our new site is designed so that you can easily find exactly what you’re looking for as soon as you arrive. It's now much easier to find articles through a new navigation system that is categorized by departments. 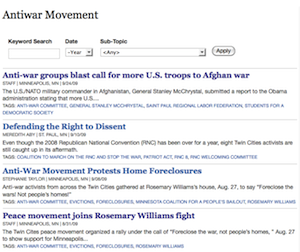 To see all of our articles about the Antiwar Movement, for example, just visit its department page by navigating to "People's Struggles -> Antiwar". This is a great way to find articles in our archive that are no longer on the front page. Convenient drop-down menus make all of our content available from any page on the site. In addition to better navigation, the new site has a built-in search feature. Just enter your query in the search box that appears on every page, and the entire site can be searched in an instant. Fight Back! News is a people’s news source, so we wanted to make sure that the community has a voice on our web site. Every news article now supports comments, and anyone can post. You must register to post comments. We ask our readers to be respectful of each other and follow the Guidelines for Comments. News is meant to be shared, so we have made it easier to share our articles around the web. Built-in tools make it easy to share our news stories through email, Facebook and other social networks, or by printing out paper copies. Fight Back! has correspondents across the United States reporting on the latest developments in the people's struggles. To stay on top of breaking news, follow us on Twitter, Facebook, or join our email list. We hope you find these new features useful! Questions, comments, and feedback about the new site can be directed to the webmaster. We welcome your opinions and suggestions about the new site's design and functionality. Please leave a comment on this page to let us know what you think.